Got a group and want to get physical? 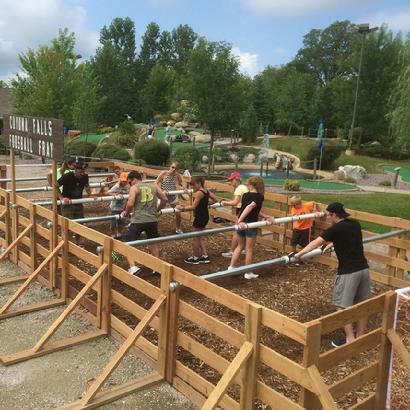 Try our Human Foosball Arena! Great game for kids and adults to play together. It's like playing a soccer game, but you have to hold on to a pole! We use a Soft Soccer Ball to avoid getting hurt. allows for 12 active players and three substitutes. Additional substitutes can play for $5.00 each, 10 minutes of prep time for rule review and team assignments is free.